Summary (from the inside flap of the book): When popular radio personality West McCray receives a desperate phone call from a stranger imploring him to find nineteen-year-old runaway Sadie Hunter, he's not convinced there's a story there; girls go missing all the time. 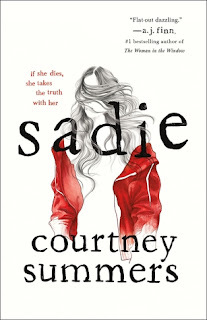 But as soon as West's boss discovers Sadie fled home after the brutal murder of her little sister, Mattie, he sees the making of something big and orders West to the small town of Cold Creek, Colorado, to uncover what happened. Sadie has no idea that her story will soon become the subject of a blockbuster podcast. She just wants revenge. Armed with a switchblade, Sadie follows a meager set of clues hoping they'll lead to the man who took Mattie's life, because she's determined to make him pay for it with his own. 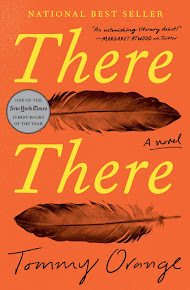 But as West traces her journey to the darkest, most dangerous corners of big cities and small towns, a deeply unsettling mystery begins to unfold--one that's bigger than them both. Can he find Sadie before it's too late? Review: I worried that I didn't give this book a fair chance since I read it while I was sick with a high fever and major sore throat. I ended up reading it in the middle of the night as the Tylenol kicked in and really liked it. This book had good reviews on a couple blogs I read and they were right. I loved reading the podcast transcript as I hadn't read a book that used that format before. It reminded me of the podcast Serial, whose first season I really enjoyed. I also liked the parallel sections of the podcast following Sadie and Sadie's actual experiences. The format worked really well. The story is an intense one with social issues of poverty, neglectful parenthood, and child abuse rearing their ugly heads. The story does a great job of showing the drain these issues have on communities as well as on the individual. 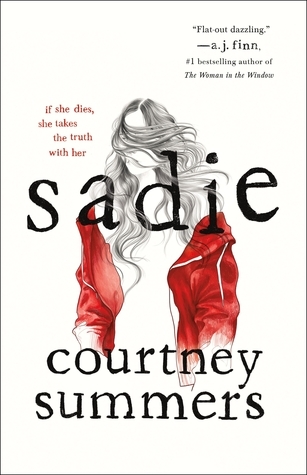 It is easy to understand and feel Sadie's anger as she tracks down the man whom she believes killed her sister. The ending is a little unsatisfying, but not in a bad way. I wanted everything to be okay and it isn't, but that is more realistic than a pat wrap-up.